Programmers, prepare to travel to the golden era of rock and roll! It’s Andy Gesner and the HIP Video staff with a video from 1970’s light rock star Jon Pousette-Dart, a man who entered the spotlight at the age of 13 and never quite left to this day! Jon Pousette-Dart teams up with adult contemporary rock singer Jaime Kyle to bring you “Who I Am,” a moving video that deals with hardships of loved ones suffering from Alzheimer’s Disease. 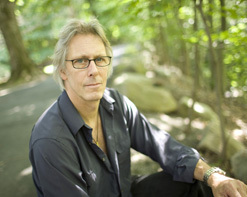 Jon Pousette-Dart entered the world of music success in his teens as part of the teenage sensation Tony and the Tigers. Jon later went on to form The Pousette-Dart Band, mining the same musical territory as the Eagles, James Taylor and Little Feat, and released several successful records on Capitol, recorded in Nashville with award-winning producer Norbert Putnam, making appearances on the Billboard 200 in the late 1970’s and 1980’s. During this time the band became one of the busiest touring groups in the US working with such acts as The Byrds, Bonnie Raitt, Little Feat, James Taylor, The J. Geils Band, Eddie Money, Manfred Mann, Jonathan Edwards, Orleans, Mahavishnu Orchestra, Emmylou Harris, Father Guido Sarducci, Randy Newman, Journey, Billy Joel, and many more including the now famous Frampton Comes Alive tour, and the progressive Yes Fragile tour – playing arenas from Coast to Coast. When The Pousette-Dart Band took a break, Jon established himself as a respected songwriter in collaborations with NRBQ‘s Al Anderson, Gary Burr, Jennifer Kimball, John Bohlinger, Tom Kimmel, Fred Knobloch, Kostas and many others.. Jon continues to work as a session singer and musician, and in film & TV, working on jingles, producing 5 episodes of the History Channel’s series Gunfighters of the West, acting in a national Diet Coke ad, as well as getting a his song “Fall On Me” placed in ABC’s wildly successful American serial drama television series Lost. Jon has also released well received solo work in 1990’s and 2000’s, includingPut Down Your Gun to support the Anti-Handgun Coalition. Jon Pousette-Dart now teams up with adult rock contemporary singer/songwriter Jaime Kyle, who appeared on the national TV music talent show Star Search and went on to sell an amazing 19 million CD’s, for the touching track “Who I Am.” The song written by Jaime, Jon and Dawn Young who directed the video, deals with the emotional difficulties of having a loved one succumb to the tragedy of Alzheimer’s Disease, which causes people to forget those closest to them. The video follows Dawn Young the filmmaker visiting her mother at a rest home in Bethlehem, PA. as she struggles to remember who Dawn is, with clips of Jon and Jaime performing the song. The track comes off of Pousette-Dart’s new record Anti-Gravity, an album that marks another major milestone in Jon’s remarkable trajectory. The album consists of eight songs graced by instantly engaging melodies, each an endearing encounter that aptly reflects the many aspects of his varied musical persona. Anti-Gravity is also sports a star-studded illustrious cast of collaborators. Jon co-produced it with Jim Chapdelaine with who he wrote the title track. Co-writes include Grammy winning producer Gary Nicholson, and chart champs Angelo and Jaime Kyle. Jon Pousette-Dart is currently touring with the Pousette-Dart Band , featuring Jim Chapdelaine, Paul Socolow and Eric Parker, and as a solo artist in support of the record. We are honored and thrilled to bring you a video from an old-school rock and roller that continues to redefine his sound in the modern era, where good heartfelt rock music is hard to come by. The song was written for the upcoming feature documentary about Alzheimer’s disease “Forget Me Not” (www.forgetmenotfilm.wordpress.com) Please support this emotionally charged video within your playlists this fall season. If you need more info, call Andy Gesner at 732-613-1779 or e-mail us atinfo@HIPVideoPromo.com or John Condon at Pousette-Dart Management, at at 615-385-0001 or Condon@comcast.net. You can also visit www.Pousette-Dart.com to find out more about Jon Pousette-Dart and tour dates near you.